When families gather to celebrate Thanksgiving, you want it to be a festive occasion. Small touches, like colorful Thanksgiving napkins, can add to the feeling of this special holiday and help you make your holiday table come alive. 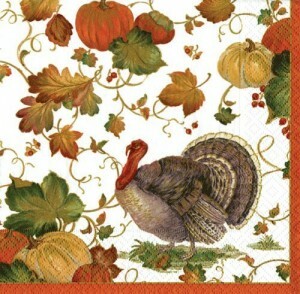 Thanksgiving napkins can help you carry through your holiday theme as they serve a useful purpose for your guests. Creative Converting is a party supply wholesaler that carries a number of products to help you convert your home or other venue, from ordinary to something really eye catching, for those special occasions. Their Thanksgiving Blessing Lunch Napkins are sure to add some bright color and interest to your dining table this Thanksgiving. You can purchase matching paper plates, cups, and even a Thanksgiving tissue Centerpiece all matching the napkins. Most families would find it impossible to keep and store enough cloth holiday napkins on hand for a large family gathering. These paper napkins are large enough to meet guests needs, and since they are disposable, you won’t have to store them from one Thanksgiving to the next. Since these Thanksgiving napkins are a paper product and paper products abound, the reviews for these specific napkins are few and far between across the internet. The one or two reviews that could be found however are quite positive, with customers finding these napkins both festive and a nice size to use for their Thanksgiving dinner. Creative Converting also offer a range of holiday beverage napkins. Since many families enjoy before or after dinner drinks, these Settlers Feast Thanksgiving Beverage Napkins will help to keep your stands and end tables from bearing those water marks that are often a result of glasses being set down and left behind. These Settlers Feast Beverage Napkins are the perfect size for those enjoying a before or after dinner drink and will also work well as dessert napkins. Unfortunately, there are no reviews to be found as yet for the Settlers Feast Thanksgiving Beverage Napkins. However, reviews for other Creative Converting napkins are quite good, so this particular napkin could be well worth adding to your Thanksgiving décor. For those of you who want festive Thanksgiving napkins without the standard turkey décor, the colorful Mayflower Celebration Dinner Napkins offered by Creative Converting are a colorful and beautiful choice. These mums on these beautiful paper napkins are bright and festive and should bring a lot of color to your dining table. 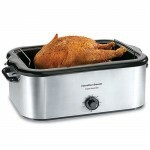 While they are great for Thanksgiving, they can easily be used for any fall get together. Like most other paper napkins, reviews for these specific napkins are few and far between on the web. However, other reviews for Creative Converting napkins clearly indicate that these napkins should meet your needs while providing a splash of color for your dining room table. For over 60 years, Caspari has been a manufacturer of printed paper products. Their colorful and festive Thanksgiving Autumn Harvest Dinner Napkins can add a splash of fall color to your Holiday table. These Thanksgiving dinner napkins have just the right features to add a festive touch to your dinner table. If you are looking for an inexpensive way to add color and a touch of festivity to your Thanksgiving table, then these beautiful paper napkins will do the trick. These napkins look beautiful when you set your table with a white table cloth, white dishes, a colorful pumpkin and flower centerpiece, and add these napkins as the final touch. Like other paper products we have reviewed, there is not a plethora of reviews for the these Thanksgiving napkins as yet. These Autumn harvest dinner napkins are beautiful and would be a welcome addition to any Thanksgiving dinner table. Since 1962, Benson Mills has been a family owned linen company and is considered to be the faster growing linen company in the United States, offering a wide variety of beautiful linens to meet consumer needs. The Benson Mills Set Of 4 Harvest Splendor Damask Napkins can be purchased either along with the matching table cloth or by themselves. For families who want enjoy the elegance of setting a holiday table using a cloth tablecloth and napkins, the Benson Mills Set Of 4 Harvest Splendor Damask Napkins may be an ideal choice to brighten up your Thanksgiving dinner table. The Benson Mills Harvest Splendor Damask Tablecloth is beautiful. However, finding even a picture of the matching napkins is impossible. It is extremely difficult to give an impression of a product that you don’t have either a picture or a good description of, so we will let the reviews do the talking for this product. There are only a handful of reviews for the Benson Mills Set Of 4 Harvest Splendor Damask Napkins, but these reviews are exceptionally good. Combined with the matching tablecloth, these Harvest Splendor napkins will add a touch of elegance and sophistication to your Thanksgiving dinner table.